On Thursday, February 28th, 2019 and Friday, March 1, 2019, officers from the Atwater Police Department, Merced County Sheriff’s STAR team, State Parole, and Merced County Probation Department conducted a series of probation and parole compliance checks in various locations in the Atwater/Winton Area. During the operation, Atwater Police and the Merced County Sheriff STAR team executed a search warrant in an apartment complex in the 2800 block of Nashua Street in the City of Atwater. 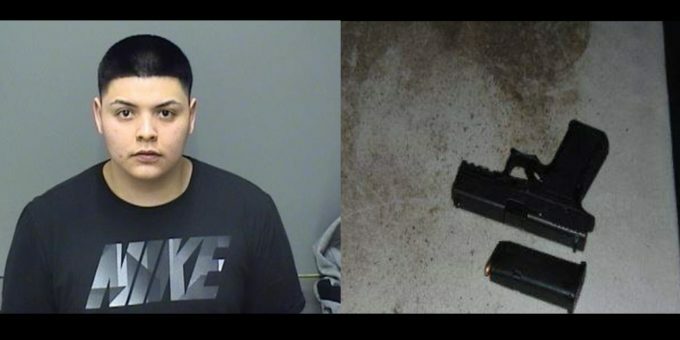 During the search, officers discovered that one of the occupants of the apartment, Gerardo Torres, 20-years-old, an Atwater resident, was in possession of a firearm and ammunition. Officers learned that Torres was a convicted felon and prohibited from possessing a firearm. Torres was arrested on a variety of weapons charges that include being a felon in possession of a firearm and a felon in possession of ammunition. The Department is forwarding this case to the District Attorneys’ office requesting that charges be filed. This case is still under investigation. Chief Salvador would like to commend the collaboration and thank all the agencies involved in making this operation a success. The Police Department encourages residents to report suspicious activity by contacting the Police Department at (209) 357-6396.